The Philadelphia Eagles have lost a game, and are not invincible. Obviously, Doug Pederson should be fired, Howie Roseman should board a space shuttle destined for the sun, and Jake Elliott should stand in the middle of the city so that everyone can spit on him for having the audacity to miss a field goal. The Eagles' have improved their corner situation considerably since those days, but they looked a lot like the Bradley Fletcher days of years past against the Buccaneers. The secondary as a whole was bad, really. Malcolm Jenkins bit the cheese on DeSean Jackson's 75-yard TD reception in the Bucs' first play from scrimmage of the game. Jalen Mills took most of the heat for that play, but Jenkins was clear after the game that was on him. Still, Mills had plenty of other not-so-great moments. And then Ronald Darby. Yeesh. This was a horrendous tackling effort against O.J. Howard, that turned into yet another 1-play, 75-yard TD drive. Ugh Birds D Burned AGAIN! In our five matchups to watch, we noted the Eagles' need to limit the killer big plays, which was as easy an observation as one could make against this Bucs team, with the vertical threats they possess. Sometimes that's easier said than done? Whatever the case, the secondary looked a whole lot like the bad old days. Remember when the Eagles had the worst set of wide receivers in the NFL back in 2016? Well, they weren't working with a group much better than that on Sunday after Mike Wallace went down with an ankle injury. We won't get the snap counts until Monday, but the Eagles had guys like Kamar Aiken, DeAndre Carter, Shelton Gibson, and Josh Perkins (a tight end playing a wide receiver role of sorts) playing significant roles in the offense. Prior to the start of training camp, none of those guys were even locks to make the team. The Eagles had nothing in the way of a deep threat that the Bucs had to respect, so they played the Eagles similarly to the way most teams played them in 2016. They tried (successfully, mostly) to take away the intermediate parts of the field, limiting the effectiveness and yards after catch opportunities for legitimate NFL targets such as Nelson Agholor and Zach Ertz. After the game, Pederson was asked what the thinking was in playing Perkins over Dallas Goedert. Pederson gave a semi-confusing, long-winded answer that is only going to take up space on the internet. In the interest of brevity, and at the risk of putting words in Doug's mouth by translating it, I think he was merely inserting in Perkins in a wide receiver role once the team lost Wallace for the game, while keeping Goedert in the same No. 2 TE role that was carved out for him in preparation for this matchup. 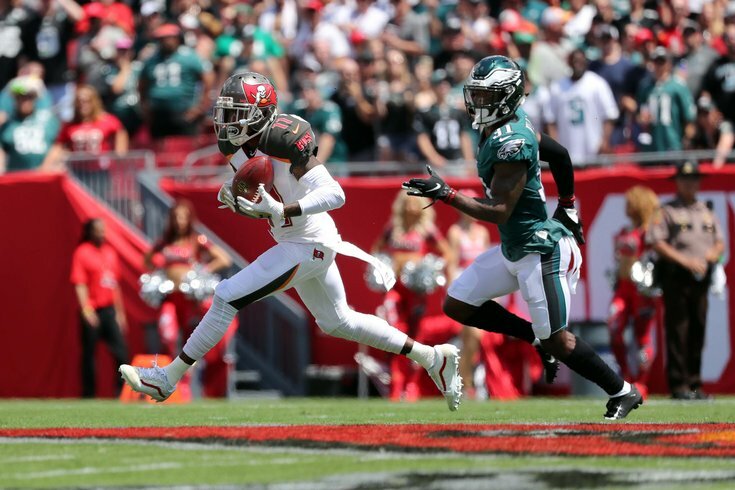 The Eagles likely had a game plan in place in which they wanted to take advantage of the Buccaneers' young corners, who were playing because they were without starters Brent Grimes and Vernon Hargreaves. So, OK, I get that to some degree. However, my counterpoint would be that once you're playing four guys who are fringe NFL roster-worthy players at wide receiver, maybe you just chuck that game plan out the window and play with more two-tight end sets, getting the more talented Goedert onto the field. Facing a 3rd and 11 with around three minutes left in the first half, Pederson ran a draw play to Wendell Smallwood that was easily stopped short of the first down marker. "I felt like the defense was going to be in soft Cover-2'ish, and a five-man box, and thought we had a chance maybe to break a run," Pederson said after the game. Again, I can understand that when you're trotting out the names already noted above at wide receiver, converting a 3rd and 11 is a lot more difficult than when, say, you add a guy like Alshon Jeffery to the mix. But a draw to Wendell Smallwood? Wendell Smallwood? Come on. "I was going for that one anyway, regardless of percentages," Pederson said. "We were plus-50 and I was going for it. I felt that we had a little momentum on that drive, and felt confident that we were going to get the first down. So I was going for that one." At the end of the season last year, we determined that the Eagles scored 71 more points by going for it on fourth down than if they had punted (or attempted a field goal). All season long, Pederson gambled and mostly won. We noted that it was highly unlikely that every Eagles season would have the same level of success on fourth down that they enjoyed in 2017, but that more often than not, going for it is absolutely the right call. It was the right call on Sunday, too. The Eagles were down 13, they had a manageable distance to go to pick up a first down, and the benefit of scoring a touchdown on that drive outweighed the downside of giving up 35 or so yards of field position to a big-play offense that had already proven it could score from anywhere on the field. So I'll just say this. Before you really want to kill that decision, remember how much fun you had at the Eagles’ Super Bowl parade because Doug Pederson has some balls. The stat sheet will show that the Eagles "only" had 6 penalties for 55 yards. It's when they occurred that killed the Eagles. On the Eagles' second drive, they had two plays to start the drive that went for 17 and 14 yards. Great. Nick Foles is starting to get into a rhythm! And then... Nelson Agholor illegal crackback, 15 yard penalty that also negated an 11-yard pass play. Jason Peters, illegal block above the waist, 10 yards. Corey Clement, tripping, 10 yards. Backwards. Instead of 1st and 10 at the Bucs' 45, they were suddenly 2nd and 40 at their own 14. That drive was really a killer in terms of self-inflicted wounds. In 6 games against his former team, Jackson now has 23 catches for 569 yards (24.7 YPC) and 3 TDs. The Eagles are now 1-5 when they have had to face him. While yes, Jenkins was the player most responsible for DeSean Jackson's opening play touchdown, he was also responsible for one of the headier plays you'll see this season. With Mike Evans trying to fight for extra yards after a reception, Jenkins had an opportunity to tackle Evans from behind. Curiously, however, he didn't. He just stood and waited for an extra beat. 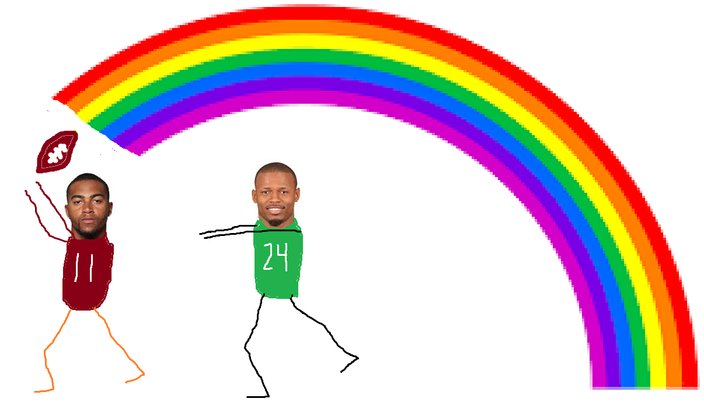 When Evans turned around, Jenkins violently punched at the ball, and caused a fumble that the Eagles recovered, at a point in the game when they desperately needed a turnover. That was incredible, next-level situational awareness. In my 2018 season predictions, I had the Buccaneers picking first in the 2019 NFL Draft, which seemed like a reasonable thing at the time, seeing as their starting quarterback was suspended and they had arguably the worst defense in the NFL a season ago. Oops. They're 2-0 with wins over the Saints and Eagles. Prior to the game, a report emerged that Wentz will likely start Week 3 against the Colts. Nick Foles wasn't bad against the Bucs, but I believe that this was the kind of game that "2017 Wentz" could have put the team on his back and won. I guess we'll see soon enough if indeed (A) Wentz will play Week 3, and (B) if he's the same player he was a season ago.